Spirit Of Zebedee has only produced slow times and may find this distance too short for it and a potential lay. Windforpower recorded a fast time here last year and if getting back to that level could at least make the frame. Santafiora looks to want a longer distance to show its true worth plus I'm not sure this surface actually suits it so another potential lay. 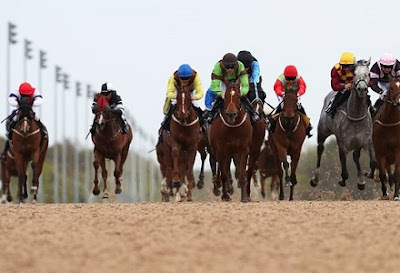 Little Nosegay has won over this surface and distance at Wolverhampton but only in a slow run race I doubt that will happen on this straight course so a potential lay. Tihana is a eight times raced maiden and I doubt that will change here at a distance that looks too short for it to show its worth so a lay. Fuel Injection comes out fourth on my figures from a 2017 time but this surface isn't its favoured, it might make the frame but I doubt it can win. Novabridge could be the one to set the pace in this race, it comes out top using 2017 times and joint top on this years times so could lead all the way here. Monsieur Mel hasn't shown much form wise in its six runs and looks as though a longer trip would suit it better so another lay. Fintry Flyer is third best using 2017 times and joint top using this years and should be staying on at the finish and could at least make the frame. Reflation is another that may prefer a longer distance to show its best, the trainer has a poor record here and another I would look to lay. Griffin Street may need this run to gain fitness but there's a decent jockey booked to ride who has a good record for the stable but it may need further to shine fully. SUMMARY: I've got negatives against a lot in this race and i will look to lay them if there's any value in doing so, Fuel Injection could possibly make the frame if something else falters, Windforpower 9/2 could run well here and maybe even win if others don't reproduce their best, Fintry Flyer 2/1 should be staying on strongly at the finish but maybe not quite quickly enough if NOVABRIDGE 5/1 leads and reproduces its best time of last year. I will go with backing the selection but will have small covering bets on the 2 other highlighted horses.